Cook County’s Transportation Plan Thinking Big, But Where’s The Money? A description of Cook County’s draft “All Aboard” transportation plan scenario. Earlier this year, Cook County embarked on its first transportation plan since 1940, asking residents to weigh in on how and where to improve transportation across the second most populous county in America. That feedback has helped the transportation department to draft a new vision statement [PDF] – that world-class transportation will spur economic growth and enhance quality of life – plus four scenarios for the future [PDF], which the public can vote on in an online survey. The new plan will guide policy choices that determine where and how the county invests its resources, and to estimate how much more revenue is needed to fulfill those goals. One key policy decision will determine whether or not the region will fight for more resources in Springfield. One particularly galling imbalance is the Illinois Department of Transportation’s strict 55/45 split, which sends an outsized proportion of dollars downstate even though most of the state’s people and economy reside in Chicagoland. The most dour of the four scenarios envisioned is called “Running on Empty.” It supposes that the current conditions depressing local transportation investment – the 55/45 split, declining gas tax revenues, municipalities looking out only for themselves, and sprawling, low density growth – will continue to “undermine” Cook County’s transportation system, communities, and economy. A slightly less depressing scenario, “Stuck in First Gear,” differs minimally from the first by supposing that the county will pursue additional grants from the state and federal governments. The county would rein in sprawl slightly by encouraging more density around train stations, for example. This would increase use of some underutilized bits of the transportation system, but also tax others, similar to how some parts of the CTA system are now becoming overcrowded. However, an overall lack of funding leads transit service quality to continue its long-term decline, making transit-oriented development a tough sell. Scenarios three and four more closely reflect the goals of the GO TO 2040 regional plan, but depend on the state to update its antiquated policies. “Picking Up Steam” says that Cook County would stop diverting gas tax revenues away from infrastructure, and influence the state to do the same. And instead of distributing transportation funds by a strict 55/45 split, the Illinois Department of Transportation would use performance measures to guide dollars to where they’re most needed, e.g., densely populated Cook County. Those policy changes would add funds that could address the area’s considerable maintenance backlog, and start to invest in more bicycle, pedestrian, and transit projects. However, the third scenario isn’t all rosy: It’s marred by development that continues to drift further away from existing transit and freight facilities. 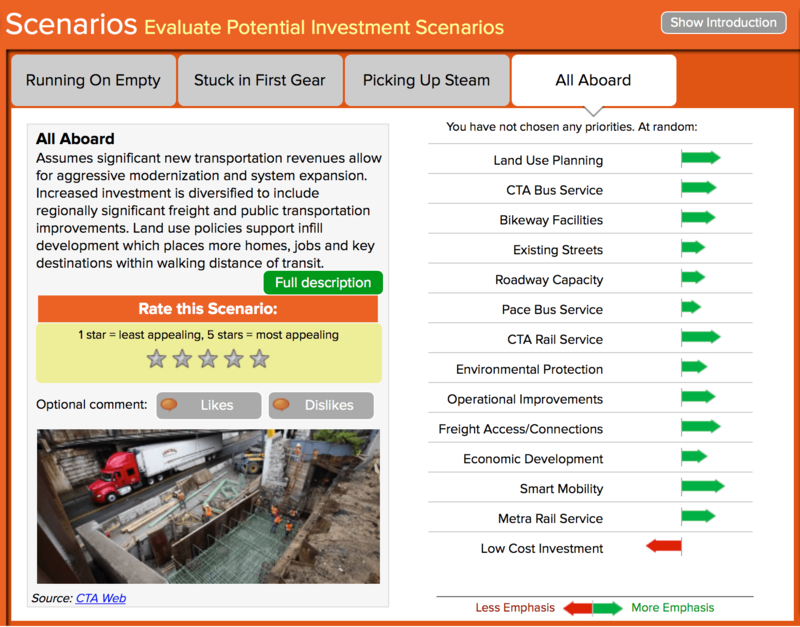 The final scenario, “All Aboard,” is one which supposes additional funding and new development surrounding existing transportation resources. Specifically, it assumes that the state gas tax will be raised by eight cents per gallon, and pegged to inflation. Policy changes would target county revenues towards compact and mixed-use development on infill locations, and expand regional transit “to reach underserved destinations.” Building within existing neighborhoods is a core tenet of GO TO 2040, and focusing new spending there would stabilize neighborhoods and expand businesses. Send Cook County your feedback on these four scenarios. Send general feedback to info@connectingcookcounty.org. Both these scenarios and the Transit Future campaign call for new revenues. This year, though, Cook County President Toni Preckwinkle has deferred introducing a new transit revenue source, instead prioritizing a fix for the county’s underfunded pensions. Increased transportation investment could spur economic development, and thus tax revenue for the county, especially if directed to income-generating investments like transit rather than roads that drain funds and damage the environment. The county prefers “All Aboard,” but it’s not clear how increasing the gas tax (in particular) would necessarily lead to transit enhancements. Gas tax revenue is primarily spent to maintain and build new roads, with a small portion of IDOT funds going to the Regional Transportation Authority. Some of this would be offset in “All Aboard,” since it also recommends congestion pricing “to reduce driving” and generate funds for other modes. That link between transit and economic development could be clarified in the County’s draft transportation plan. For example, the Victoria Transport Policy Institute says that in North America, regions with less driving (as measured by vehicle miles traveled) “tend to be more economically productive,” as are regions with high transit use [PDF], high fuel prices, and dense land uses. Road capacity, on the other hand, brings down productivity. As with all scenario plans, the Cook County transportation plan relies on a lot of assumptions. In particular, the county would have to flex a lot of political muscle to get IDOT to drop its 55/45 split, and then to use gas tax revenues for broad transit improvement projects instead of for more roads. Cook County, and the rest of the region, could take a tip from Los Angeles’ winning strategy to enact a small sales tax increase for transportation, and go all-in to realize both the transit ridership and pollution reduction goals in GO TO 2040. L.A.’s sales tax hasn’t freed it from financial struggles, but the fact that they took a risk and invested political capital to raise taxes (by popular vote, too) paid off, both in terms of increased federal resources for expanding transit and ultimately, a stronger and more productive regional economy. That’s right where is the money going to come from? Your illustration above shows it coming out of gas taexs and fees from auto users. But that’s been milked so many times for so many things and will continue to be milked when pensions have to be paid, jails built, schools funded. Politicians dont want to raise property taxes so dump more fees and tax the autos. But if the plan is to build this modern transportation system that will attract new employers and investment, it has to hit everyone and more like than not it should be a sales tax. For me though Chicago, Cook County and the State of Illinois has to do some serious political housekeeping first. In order to levy the taxes needed to build such a system clean house of the political crnies that get the juicy jobs and contracts for thier friends and families. Using the McPier, Tollway authority, RTA as prime examples of how politicians waste our money thru lousy contracts and sweet deals and packing their boards with sons and son in laws who cant hold a job anywhere else. Business as usual. If you want the public on board with billions of dollars of new taxes Start by making an office that can prosecute the grifters that not only hang on the fringes but are in bedded in every deal that comes down the pike. Maybe once we know we are not paying a corruption tax on top of all the other taxes and fees, you may find a public that will wholehearted support a regional plan as monumental as this. Where’s the money coming from? Same as always. Says it in the top graphic… from drivers. They are going to tax driving away and expect driving to pay for transit. It’s the perfect plan to collapse mobility to early 19th century levels. The fox can’t be in charge of the hen house. IDOT’s math has proven time and time again that if 1+1=2, and 2+2=4, then 4+4=64. IDOT’s performance measures all result in one type of investment: New and expanded highways, irrespective of whether they’re needed, and regardless of whether the money could be better spent enhancing accessibility through superior investment alternatives, e.g., biking, transit, etc. Part of that is the rules that govern how the money can be spent, i.e., they spend it on something for the sake of temporary IL construction jobs rather than leave the money on the table for some other state DOT to pave farmland, deserts, and whatnot. The other part is deeply rooted in a combination of federal rules, state politics, and the IDOT culture. We need a fundamental restructuring of where the money comes from, the rules for spending it, and who gets to decide how it is spent. That’s unfortunate, of course, because it is such a tall order and can only move forward a little at a time. Think glacial speed. The bright side is that even glaciers are moving faster these days – retreating, just as autocentric planning and investment; the observation that Washington State DOT recently adjusted their VMT projects significantly downward is but one indication of such erosion. Right now, IDOT has far too much money and exerts too much control on the money others have to spend, e.g., through over-representation on key committees responsible for making important decisions. Modeling is inculcated with unrealistic assumptions of continued growth in per capita VMT. The old CATS mindset dies hard at CMAP; legislative direction to merge transportation and land-use planning hasn’t worked well, particularly where many of the transportation planners are essentially highway planners that believe the region is well-served by transit and that investments made to improve it are outperformed by road expansion projects. Old CATS do eventually die, though. Everything changes with time. The system is rigged on many levels. If it were a house, with one peak behind the walls a developer would wreck it and start fresh rather than try to rehab it. Transit benefits drivers, oooBooo. Right now, transit riders pay far more in taxes to support drivers than the reverse. We’re long overdue for correcting the imbalance. As but one example, look at your municipal budget. How much of it is attributable to creating and maintaining space for cars? Include the direct and indirect costs, not some half-baked or non-existent math I’ve seen you regurgitate elsewhere. As but another example, look at the federal budget. How much money has been allocated to funding direct and indirect expenditures in support of cars? Again, a robust analysis including all agencies and programs. Think of programs like CDBG and others. Include staffing. Include consultant contracts. Don’t just look at MFT, as it is only the tip of the iceberg. Heck, even the MFT fund is subsidized using non-gas tax general fund revenues, let alone the mountain of costs at virtually all levels of government that are attributable to roads, cars, and drivers. People that spend less on transportation have more disposable income to spend in other areas of the economy. That’s a scary thought for the road industry, sure, but a fact nonetheless. Let’s also clarify one thing: I’m not an anti-car extremist. I actually enjoy driving and do a lot of it on the weekends. I also drive on vacations, rarely ever flying. I had 4,000 miles on my new vehicle before it was two weeks old. I grew up in a family that raced old Mercs, 55 Chevys, and big block Dodges – on the street, on dirt tracks, and ovals. What I am is the future. Get used to it. Driving in urban areas is becoming so 19th century. Come along to the 21st century or get left behind. It is time to figure out how to do it right. Being dragged along kicking and screaming, throwing tantrums in public places, just makes one look silly. Be productive and help shape a better future, man. Why not just take the non-motorist paid funds away from roads and use them for transit and let the new taxes on drivers pay for driving? If you’re correct you’ll have more money for transit that way. Why tax motorists for transit? Just force an honest accounting and segregation of funds. The whole thing speaks to an accounting slight of hand going on for political purposes. Likely to disguise just how much drivers are really paying compared to the costs. Over time, that is exactly what should transpire – the true costs of driving should be shifted to those doing the driving. But would you say that the true costs of public transit should be shifted to those using public transit? That could be unrealistic, unless there were an income test involved in pricing tickets. I’ve always thought of public transit (and, for that matter, untolled roads) as a public amenity paid for by everyone, whether they use it or not. Much like I have paid property taxes for 22 years but have never sent a child to public school. I am perfectly OK with this. You can’t have public schools unless everybody, including childless landowners like me, chip in; otherwise you’d just be charging tuition like a private school. Similar with roads and public transit. Decisions have to be made about how to prioritize them, but it is impractical and kind of ridiculous to say that, regardless of how much either one costs, all and only the users of that mode should pay for its upkeep. Am I making a straw man argument here? I may be missing some subtleties, and I admit that. Over time? Why struggle with passing new taxes on drivers when the general funds can be re-directed easily and quickly and starve driving? Why wait? What’s the purpose of the accounting trick? Why shift general funds to driving then shift taxes on motorists to transit? Transit has more funding without this shuffling of money according to you. Shouldn’t you be asking to end the accounting fiction rather than new taxes on drivers? It isn’t an accounting fiction: It’s a spending fact. Shifting the financial burden takes time, though it would be nice, albeit unrealistic, to flip a switch and have it happen overnight. Yes. Income-based assistance could be provided to those in need. However, the economy would be much different if we weren’t spending so much on supporting cars and driving. Thus, focusing on loading full cost isn’t as superficial a discussion as may be implied in the comments above. If the full costs of driving were borne by drivers and transit and biking were to become viable alternatives to driving, large numbers of people would significantly reduce their driving. Transit would become more economically efficient with higher utilization. Money that would have otherwise gone to planning, constructing, and maintaining roads and auto-supportive infrastructure, e.g., structured parking decks, etc., could go into other areas of the economy. Transit will always be more fiscally and space efficient on a per passenger basis than driving a car – exponentially so. Thus, there’s always surplus money associated with shifting to transit at a usage level where transit maximizes its potential. To be at that point, it has to be auto-competitive – which it is not currently. You’re not making sense. You have claimed non-motorists pay for the roads but then you want motorists to pay for transit. This does not make sense with regards to taking time to fix. Have the new motorist taxes pay for roads and general taxes pay for transit. You’re defending an apparent needless accounting shuffle because it would take time to fix. If non-drivers subsidize drivers it takes no time to fix. It is just a spread sheet entry, a label, for already identified monies. It can be accounted for in a straight forward way. But, if motorists are actually paying for the roads then it will take time to find new sources to pay for transit later while motorists pay for transit now. This, Wilmur, is what does not make sense: Continuing to make the same types of investments over and over while expecting different outcomes. Cook County needs to stop throwing good money after bad and start building-out a 21st century multi-modal network. Huh? It’s not about what we should or should not do. It’s about math regarding the financing. I should not need to repeat myself on that point. Should transit be expanded, I would say yes if it was done right. Should it be done in a non-transparent, even underhanded way politically so people are misled into supporting it, don’t understand how it’s being done, or can’t follow what is being done? I would say no. If one curtails spending on eating fast food, s/he has can choose, instead, to buy quality food to cook at home. You’re right, you shouldn’t have to repeat what you’ve already said. It may be good to re-examine it, though. It’s a combination of spending the same dollars differently, growing existing revenues through expansion of the base rather than increases to the rates, and some new revenue streams. As it now stands, the public does not understand the math and the politics drive only only one outcome: New and expanded road capacity, with alternative transportation being an afterthought. Your’re right: People need to understand how their money is spent, the outcomes it is cultivating, and how a different investment portfolio would generate improved outcomes (and a better rate of return). There is no need to re-examine it. It’s quite simple. Motoring is being treated as a funding source and transit as a cost. This treatment is a very strong indicator of subsidy direction. I will repeat. It is easier to reassign existing funds than it is to increase taxes. If subsidy flowed away from transit it would be easy to change direction of funds. If subsidy flows to transit then new monies must be found. The easiest place to find new monies is the source of the existing flow. The path of least resistance. The ease to which transit funding is reduced and monies directed to driving funding also speaks to the direction of subsidy flow. As long as the default funding source for transit (roads and public transit included) outside income, sales, and property taxes is motorists (including private and commercial vehicles), then spending on roads will be an easy sell. After all, the people being taxed are the ones benefiting from the use of the tax revenue. This makes sense and also is probably good policy. But it does take some political effort to redirect that money to public transit that does not necessarily benefit – directly and one-for-one – the people paying the taxes. That is not to say that this also might not be the correct (moral, political) solution, but it does demand some scrutiny. I pay school taxes but have no children, and I’m OK with that because of the need for an education populace and the necessity of spreading that cost over the whole population. Anyway, it is my surmise that, as a group, drivers on average have more money (income and assets) than non-drivers in the U.S., based merely on my intuition that if you own and maintain a car, you must not be totally impoverished (correct me if I am wrong about this surmise.) Assuming this is true, it is not surprising that motorists are the ones who get tapped for transit funding for all purposes; they presumably are better able to afford it. But of course, using averages as a substitute for investigating facts results in the story of the guy who drowns in a river with an average depth of three feet. What I mean is that our addiction to taxing motorists unfairly hurts the marginal cases of rural and suburban poor (or even those just getting by) who have to drive to make a living and live meaningful lives. At the other end of the spectrum, relying on motorists to fund public transit unfairly benefits the marginal case of rich or at least well-to-do urban-dwelling people who can take advantage of cheap public transportation being funded, to a great extent, on the backs of motorists, including the poor ones. The ability to take the L is a huge windfall to anyone, but more so the millionaire in Lincoln Park, for whom it is a cheap and amazing convenience but not a necessity. At least this is the story I have been led to believe; if it is not true, tell me why. If it is true, then let’s start talking about how to fund public transit fairly. I realize that public transit is funded in many ways, including federal income taxes that are not based on car ownership/use. But it is also true (or if not, please provide some good citations) that the owners and operators of motor vehicles pay a LOT more taxes related to their vehicles than those who do not – whether by choice or circumstance – do not own and operate motor vehicles. Whether true or not, a great many of those people believe that they are overtaxed and underserved even by today’s road system, and they naturally take great umbrage at efforts to simultaneously tax them more and reduce the services they directly benefit (car-centric roads). Again, as long as drivers are being taxed to pay for roads, few have much to complain about; that equation changes when they are asked – as increasingly they are – to fund projects they will not use. For the record, just as with my property taxes going to public schools I don’t have children to send to, I personally get and am on board with this, but it is naive and somewhat ridiculous for transit advocates to pretend to be shocked when car owners raise objections to being the go-to source for transit funding when non-vehicle specific taxes (income, sales, etc.) fall short. Car owners pay many taxes in Illinois and Chicago that non-car owners never have to think about: state license, City sticker, sales tax when they purchase the vehicle, sales and other taxes on fuel, sales taxes on tires, oil, and other things necessary to maintain the vehicle. My feeling is that this is a bargain you make when you buy a car, and just like you should not eat in a restaurant if you cannot afford the tip, you should not buy a car if you cannot afford the taxes, the fact is those taxes add up to hundreds of dollars a year, even for a cheap, beater of a car. That drivers might resent being tapped for more money to be spent on services they do not directly benefit from should not be a shocking surprise to anyone. The wider issues you bring up are beyond the scope of what I wished to discuss. I wanted to only discuss the notion of where monies came from. The wider scope is more philosophical. Your reply took time and thought so I will take a stab at it. When you pay for property taxes for schools, who’s voice shapes the policies and education? Bureaucrats. Intellectuals. Politicians. Sometimes in far away places like DC. You don’t have a child so your voice does not count. I do not have children, but I pay too, but without children my voice does not count. I am not a customer of the service. Only paying parents count. But so much money comes from people who have no say, parents don’t matter much. The politicians and bureaucrats and intellectuals can do pretty much as they please and have. Some places are different. Where most people have children and property and can afford to move…these places tend to have good schools. Americans want someone else to pay these days. They believe they deserve transportation, healthcare, education, and more paid for by someone else. Government obliges. When someone else pays, government decides. That someone else, like you and me with schools, gets no voice. We can complain. We can vote. But that usually does not change anything. Those receiving do not pay or pay little so they have little/no say either. Power over politicians is diluted so politicians can have it for themselves alone. Politicians and bureaucrats and intellectuals care for themselves. They will decide on what is best for them. What makes their careers better. What puts money in their pockets. Unless people pay attention and organize to stop them that is what they do. Third party paying makes organizing difficult. People fight amongst themselves. They are divided. The politicians get away with it. But people like this system. They think they can make other people pay for what they want. Sometimes that happens. Sometimes it doesn’t. Either way they don’t notice the politicians get very very wealthy. They don’t notice government employees making the plans get paid very very well. If government can mix funds all the better. Even if transit were fully paid by users and driving was fully paid by drivers they would mix the taxes and money. Make it difficult to see who pays what so they get their way. But their actions will still give them away. On another topic you bring up: One can be poor and own car. Mandatory insurance and taxes are the large expense. Tickets too. Buy an old car. Maintain it yourself. Cheap. Not as cheap as it used to be because of more taxes. May become impossible but not because of the car itself. Oversimplification and incomplete analysis leads to faulty decision-making, which is what we’ve grown accustomed to over the past few decades. We shouldn’t get acclimated to being spoon-fed analysis and recommendations that are derived using a past predicts the future methodology under-girded by erroneous assumptions. Why repeat the same errors over and over? Where’s the accountability for outcomes? We need to spend smarter, not necessarily more. Cook County can choose to blaze a trail to a brighter future or it can maintain the status quo. We can support a 21st century transportation network or continue to build-out the mistakes of the 20th. Personally, I think Cook County should lead, not follow. There are no five-year-old lemmings; we need to think for ourselves. You are responding like a politician who is avoiding answering a question, avoiding a topic. Instead of discussing the funding flows you speak in flowery terms of your political goals that only serve to distract the discussion. To divert attention away from the facts. To appeal to feelings. This is no longer a discussion of value to me. I am not interested in flowery political appeals. You say think for yourself. To think for yourself you must be the customer and be the one that pays. Otherwise government thinks for you. If you pay but do not use government decides. If you use but do not pay government decides. If you pay as you use you decide. According to CMAP, "Regions that are more inclusive have longer, stronger periods of prosperity and shorter periods of stagnation."